I am one very bored boy. And mama hasn't done a good job at all of keeping up my blog! Here's a picture of me just a day or two after surgery. They say my surgery went very well. Frankly, I don't remember much about it very clearly - I was pretty drugged there for awhile! All I know for sure is that I now have this very strange haircut on my leg and I'm being kept away from Jeffie and Lucy. Mamma and Daddy fixed a sort of pen for me right in front of the floor to ceiling windows in the living room, so I do have a good view of my kingdom. (Plus I was definitely part of the action at Christmas!) I've got new monkeys (that's what we call toys) and I get to go on walks in the front yard. To tell you the truth, I like the special treatment! But, I admit, I try to escape now and then. You know, I had similar surgery on my other back leg years ago when we lived in Virginia. My vet here was surprised that I hadn't needed it on this leg long before now. 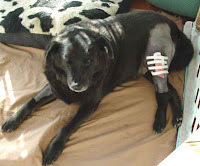 What I had was anterior cruciate surgery. You can read more about it here and here. Plus, when I had it before, Mama found this blog that gave her courage. These days I spend a lot of time napping and I've finally gotten my appetite back. Everybody seems real happy about that. Trouble is, when I'm being walked, Jeffie sneaks in my private spot and steals my monkeys! He's such a rascal! I can't wait to be free again and remind him who's boss.